As President Borg Lecter threatens to annihilate the Country tribes in order to expand his glass-domed empire, Adele ventures into the belly of the beast. Her only hope of survival is the consolidation of Dwellers and Country power before it’s too late. Former demagogue President Nailin is eliminated, yet civil unrest infects every alliance. To save Adele, President Tristan faces his greatest challenge yet: unifying unfriendly Dwellers in the Tri-Realms to raise an army against Lecter. Meanwhile, Dazz must convince the Ice Country leaders to march with Siena and the Tri-Tribes on the gates of the Glass City. The world sits on the edge of a knife. Will Adele, Tristan, Dazz, and Siena defeat Lecter and his army of killers before the Glassies wipe them off the face of the Earth? Today, I have a very special guest on The Cover Contessa. Before I post my review of this most awesome book, I'd like to introduce you to Perry. Perry is well known in Fire Country, and I wanted you to get to know him a bit, too. So say hello to Perry! PERRY THE PRICKLER SPEAKS OUT! Hi! *Sways slightly under a heavy fire country wind* I’m Perry the Prickler, but you can just call me Perry for short. I’m very searin’ excited to be here today. I feel extraordinarily lucky to have been invited by Brooke to write a guest post for her blog (whatever that is). She even said it would be OK if my acquaintance, David Estes, types it out for me, on account of the unfortunate fact that I don’t have fingers. There is a Perry fan club in the world, if you didn’t know. How does this make you feel? What would you like to say to your loyal fans? What? Who? Where? Fans? No! Nononononono! I had NO IDEA that I (moi, Perry the Prickler) had FANS! Usually all the fangirling and love goes out to the good looking characters from Fire Country, like Circ (the baggard! ), who all the girls thinks is the smokiest, or Feve (the wooloo tug-lover), whose markings make the ladies go wild. It’s nice to hear that (finally!) some people have realized what an integral part of the story I am. But I know that some of you might be a little confused right now, because “pricklers” ain’t that well known outside of Fire Country. So what is a prickler? A prickler is what most people would call a cactus. We come in many shapes and sizes, sometimes carry drinkable liquid inside of us, and occasionally wear flowers in our hair. We tend to grow in hot, desert-like climates, like Fire Country, for example, and protect ourselves with spikes all over our skin (prickles). And apparently, I’m the most famous of the pricklers. Woot woot! So back to the topic at hand. My fans!!! Mwah mwah mwah mwah mwah mwah! *making kissing noises* I love you all! I’d marry you and have your babies if I had the good to do it. But alas, I’m confined to living out my days stuck in the sand on the northern side of Fire Country. But I’d love some visitors! If you want to visit, my address is Dune 28, Confinement Row, North Fire Country. And bring some lady-pricklers if you decide to come. Oh, and some of that delicious scrubgrass tea. And if it’s not too much trouble, a small beach umbrella—it gets mighty hot out here under the eye of the sun goddess! -Three- take lots of water with you when you visit me in Fire Country. It’s very dry here and dehydration is a real danger. And sunscreen too! Don’t make me say ‘I told you so’ when you turn all red. -Four- if you ever get sent to Confinement (prison in Fire Country), be sure to give me a wave and shout hello! That way I know I can start insulting you right away. The first insult is free! -Five- if you ever accidentally run into a prickler, apologize to the poor thing! You might be bleeding and hurting, but the prickler didn’t move into your way, you ran into it! Seven- never try to give me a high-five. As much as I’d like to, I can’t, and it hurts my feelings. OK, I’m plumb out of advice. All I got left is to ask that you please please please tell David to include me in more of his books. Just mentioning me in Ice Country and Water & Storm Country didn’t count. I’ve heard I’ll get a cameo in The Earth Dwellers, but I think I’m due a full-length novel all about me at some point, don’t you think? Thanks everyone for being my fans and for listening to my important nuggets of wisdom! And a special thanks to Brooke for being as wooloo as Siena and letting me rant and rave all over her lovely blog! May the sun goddess shine down on her always! Thanks so much for stopping by Perry (and to you, David, for typing while Perry dictated!). It was great having you both here. So, would you like to know what The Cover Contessa thought of this book? So, I'm finally getting around to writing my review of this. I never know how to put into words how David's books make me feel. I get all warm and fuzzy and teary eyed while I also get angry and outraged and want to tear out pages (which I would never do because, well, this was an ebook first of all and second of all that would just be blaphemy!). I want to thank David for 1) allowing me to beta read this book and being part of a family of people who truly care what he writes, and 2) for then sending me an ARC so I could have the pretty cover on my Kindle Fire to look at and adore! Receiving this book for free has in no way influenced my opinion or review (only David's writing did that!). If you have not read the previous books in this series, then there may be spoilers for your from those books so don't read on. But I promise not to give away any of the really big secrets this book has! So, there I went again jumping into another David Estes book and coming out on the other side still intact even after having been put through the ringer. And, as usual, the book took me barely any time to finish (two days for me with a job and three rug rats to attend to is NOTHING in the world of the working mother!). I can't say enough about this entire series. About how David's mind must just work in overload to be able to have a vision that worked itself into not just one or three book, but SEVEN! Seven books make up this most fabulous series and I can tell you now that they come together with such cohesiveness at the end, you are jumping for joy and ripping your hair out of your head and you spin in circles and sing la la songs! When I first started the Dwellers series, I was amazed at how easily David's words just flowed off the pages of the book. It was no effort to pick it up and read it and get completely and totally sucked into the story line. And then Sun Dwellers ended in this sort of cliffy and I was like, WHAT JUST HAPPENED? And then, well, then David said he was writing a companion series, ok, so I picked that up. And WOW, just WOW. He had me at hello! And I flew through the books and got sucked in by more of his characters. And then he sprung this book on me and my mind was totally blow. Not only does he pull characters from all the books into this one, but he seamlessly navigates their passage along side each other and finally to each other. I could never think that these two worlds colliding would work, but oh my hot tamales does it work. We watch as Adele and Tristan are introduced to a brand new world, one they never thought could possibly exist. And we watch as their romance waivers, but still survives through the thick of it all. We see Sienna (who I just cannot get enough of with her snarky attitude and totally sarcastic ways) still joined with Circ and fighting for what she believes is right. And we see Dazz and he continues to try and convince his community to rise up and fight for justice. Each character coming to us through their own chapters and voices. Each character lending to the total emotional roller coaster that this series has become. You will laugh, and cringe, and cry for them as you watch them make their stand. And David's writing, ugh, it's so seamless. I have to say that even my beta read barely had any errors in it. It's like it comes so totally naturally to him, it's an extension of who he is. That right there is the mark of an amazing writer. His prose are never boring, always keeping you on edge. You feel the need to turn every page and follow along as the story unfolds. David isn't edgy with is words, nor does he make you feel like he's trying to tell this elaborate story that you have to tie together at the end. Sure, he leaves you with mysteries along the way, but it's nothing your brain can't handle. And I think that's why I really love his story so much. And the plot, well, as I said, it's amazing how he draws it all together and makes it fit. You see the Dweller world, as well as the worlds above the ground. And, while this book does not take place in all the different "countries" portrayed throughout the series, you get the feel of each country, nonetheless. And there is stil a ton of world building as we learn about the King's palace and where it's located. It's like the books are each part of this puzzle that you have to put together and then you see the most awesomely beautiful picture. And it's a picture that needs to be framed and hung on a wall for everyone to see. I wish I had the talent to paint it and show it to you, but I only have my words. So here's what I was feeling throughout these books: anger, love, surprise, angst, sorrow, happiness, rage, compassion, amusement, pleasure, contempt, horror, alarm, trepidation, elation, longing, exhilaration, hope and oh so many more words that I would bore you if I went on and on and on (I may have already done so). But most of all, above all else, I felt TRIUMPH. Triumph in a world created to bring down those of lesser fortune. Triumph in a time when others surely felt fear and distance. That is how David's book made me feel. And there are some totally sad parts to this book, that I will let you know made me cry. David is not afraid to have his characters fight and lose, or fight and win. And the anger that is expressed followed by the strength and shear hope the characters possess once again amazes me. The characters achieve such clarity through the actions of others in this book that it still amazes me they could have anything to learn. But they learn from their mistakes and the mistakes of others and it makes them stronger and more unified. It gives them courage and confidence and demonstrates the faith they have in one another. So, are you not yet convinced that perhaps you should pick up this series? If you're at the end of this review, then I would say that you either have read it already, or your gonna be upset because I've kind of spoiled a few things for you! Either way, there is no doubt in my mind that this series rivals if not far surpasses The Hunger Games in it's entirety. Kudos to you David. While I am VERY sad that this series has come to an end, I am elated that I was able to take the journey and enjoy it as I went. Thanks so much for writing such wonderful stories. I can't wait to see what you come up with next! 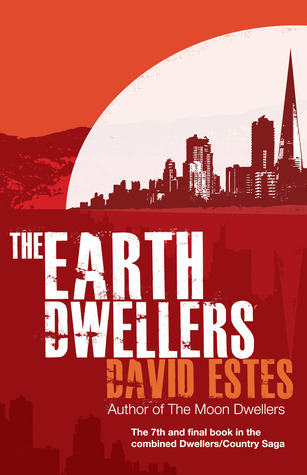 To celebrate the release of The Earth Dwellers by David Estes, the fourth book in both The Dwellers series and Country Saga, David is giving away UNLIMITED free eCopies of Fire Country, book one in the post apocalyptic, dystopian, Country Saga. A little over a year ago, David published his first young adult dystopian series, The Dwellers, and it has changed his life forever. Since then, he’s gone from struggling Indie author to fulltime writer, he’s watched in amazement as his Goodreads fan group has swelled from 300 members to over 1,600, and growing. He's been featured on Buzzfeed, as one of the '15 Book Series To Read If You Enjoyed The Hunger Games', and has just signed on to Andrea Hurst and Associates literary agency. Andrea will we working with David to expand both the Dwellers and Country Saga, taking David's career to a whole new level. So before the two series collide in The Earth Dwellers, grab the coupon code below and download your eCopy of Fire Country from Smashwords. Share the code with your family, friends and literary inclined pets. The only thing David asks for in return is that if you enjoy the read and continue on with the series, to please leave a positive review on Amazon.com, Goodreads and blogs for each of his books that you read. Simply use the coupon code: WM49N and download your FREE eCopy. The Earth Dwellers will cap off an eighteen month journey that has taken me from unknown Indie author to still-mostly-unknown fulltime Indie author. The change is a subtle one for most people, but for me it’s a dream come true. To the hundreds (and now maybe even thousands!) of readers who have come along for the ride with me, either by reading the Dwellers Saga, the Country Saga, or both, I thank you from the bottom of my heart. Now down to business. There may be some of you who have only read the three books in the Country Saga or only the three books in the Dwellers Saga, and are now thinking you’ll read The Earth Dwellers, which is supposedly the 4th book in BOTH the Country Saga and the Dwellers Saga. Well, that’s awesome! However, I must highly recommend that before reading The Earth Dwellers that you read the three books in BOTH series. Trust me, doing so will greatly enhance your experience, as The Earth Dwellers will be taking significant characters from both series and crashing them together (yes, like a water country wave) into an action-packed tale of struggle and loss and hope and friendship… And maybe a little love, too. David Estes was born in El Paso, Texas but moved to Pittsburgh, Pennsylvania when he was very young. He grew up in Pittsburgh and then went to Penn State for college. Eventually he moved to Sydney, Australia where he met his wife and soul mate, Adele, who he’s now been happily married to for more than two years. A reader all his life, David began writing novels for the children's and YA markets in 2010, and has completed 13 novels, 11 of which have been published. In June of 2012, David became a fulltime writer and is now travelling the world with his wife while he writes books, and she writes and takes photographs. David gleans inspiration from all sorts of crazy places, like watching random people do entertaining things, dreams (which he jots copious notes about immediately after waking up), and even from thin air sometimes! Recently he’s been inspired by some of his favorite authors, like Suzanne Collins, Veronica Roth, and Maggie Stiefvater. David’s a writer with OCD, a love of dancing and singing (but only when no one is looking or listening), a mad-skilled ping-pong player, an obsessive Goodreads group member, and prefers writing at the swimming pool to writing at a table. He loves responding to e-mails, Facebook messages, Tweets, blog comments, and Goodreads comments from his readers, all of whom he considers to be his friends. PERRY!!! Loved this post, Perry made me giggle! FANTASTIC review and YES! Perry should get his own book (and Fan Page) for that matter, we love that little prickler! I see an opportunity for Perry stickers, Perry plushies, Perry website, who knows what else? Great review for The Earth Dwellers! I can't wait to catch up on the rest of the series.